The donation would partly bankroll an institute bearing Marriner S. Eccles’ name, but his grandson says Koch views do not align with his grandfather’s legacy. (Trent Nelson | Tribune file photo) The University of Utah campus in Salt Lake City. The grandson of Marriner S. Eccles is calling on the U. to reject a $10 million gift from the conservative-leaning Charles Koch Foundation. 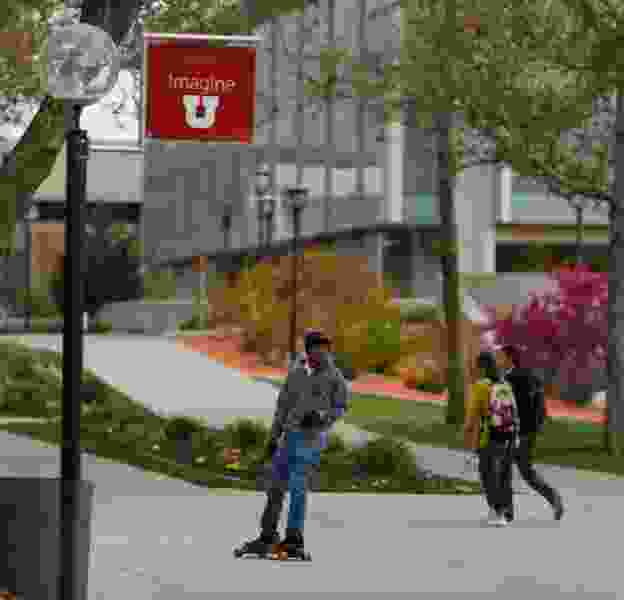 An Eccles family member is calling on the University of Utah to strip Marriner S. Eccles’ name off a new institute partly bankrolled by a $10 million donation from the Charles Koch Foundation. “None of [Marriner S. Eccles‘] positions or accomplishments throughout his life remotely resonate with any policies or positions advanced by Charles Koch,” his grandson, Marriner C. Eccles, wrote in a letter dated Tuesday. But Jim Steele, another grandson of Marriner S. Eccles and Marriner S. Eccles Foundation board member, disagreed, saying in a statement that his grandfather would have been “enthusiastic” about the endeavor. “He never hesitated to speak his mind and would love the promotion of vigorous debate over these ideas at the university,” Steele said. But Eccles, like Steele, a descendant of the prominent Utah banker, philanthropist and key architect of the post-Depression era New Deal, adds his voice to critics — including numerous U. faculty members — denouncing the Koch donation, announced last month by several members of the Eccles family. The family foundations and the Koch foundation are putting in $10 million each to establish the Marriner S. Eccles Institute for Economics and Quantitative Analysis on the Salt Lake City campus. Eccles, who lives in California, said in his letter he has “no authority over” the family foundations in Utah. But he does not support the decision to team up with Charles Koch, a Wichita billionaire businessman who is board chairman and CEO of the multinational corporate Koch Industries Inc.
A representative with the Charles Koch Foundation, based in Virginia, did not have a comment Friday on the Eccles letter. The U. Academic Senate will discuss the Koch donation and related issues at a meeting Monday afternoon, though U. officials previously said Senate members usually don’t weigh in on decisions about the school accepting gifts. Earlier this month, a group of nearly 200 faculty and staff submitted a letter to the Senate airing fears that the foundation will insert its conservative public policy agenda into the institute. The George S. and Dolores Doré Eccles Foundation and the Marriner S. Eccles Foundation said in a statement that the concern has no merit. “The gift agreements clearly provide that the university faculty has complete control over decisions,” foundation officials said — including faculty hiring and promotion, institute programming content and faculty research topics. This applies to both the Eccles and the Koch Foundation, their statement said. “The several members of the family that sit on the boards of the various foundations involved obviously gave this careful thought and believe that this Institute is promoting exactly the kind of careful and dispassionate inquiry into the full range of topics in economics in a way that Marriner would strongly approve,” the statement said. Eccles’ letter originally was included in a blog post this week by U. Department of Family Consumer Studies professor Nicholas Wolfinger. On Friday, The Salt Lake Tribune obtained a copy of letter from Eccles. The Charles Koch Foundation has donated money to at least 300 other universities nationwide, many of which have been met with criticism that Charles Koch and brother David Koch are seeking to interject libertarian and conservative ideology into higher education, including skepticism over climate change. “Aside from perhaps a shared belief that private economic markets are the most efficient mechanism for allocating scarce resources among competing needs, Charles Koch and Marriner Eccles have nothing in common,” he wrote. An agreement covering the U. donation allows the Kochs to dole out the funding in one-year increments until 2024 — an arrangement that upsets many faculty members who believe that the U. should have negotiated getting all the funding upfront. Eccles wrote that the Academic Senate should ”renounce” the gradual funding arrangement. And, he said, even if the Kochs agree to give the whole $10 million gift upfront, the U. should take his grandfather’s name off the building. In an email, U. spokesman Chris Nelson said school officials understand there are differing opinions about the donation for the institute. The U. donation isn’t the first by the Charles Koch Foundation to a Utah university. In May, the foundation teamed up with the Huntsmans, another prominent Utah family, on a $50 million donation to Utah State University’s business school. Eccles said in an email that he wants the U. community to frankly and openly discuss these issues. “The future guidance and vision of the University is a part of this wider discussion, and all who share a love and respect for the University need to be heard both now and for future generations,” he wrote.